Investigators continue to scour the woods across from a state police barracks where two troopers were ambushed, leaving one fatally shot and another critically wounded. Troopers also set up a checkpoint near the site where they were stopping motorists to ask if they had seen anything that could help with the case, according to The Times-Tribune. The developments come as a nonprofit group increased its reward to $75,000 for tips about Friday's deadly assault at the remote post in northeast Pennsylvania. Reporters saw investigators walk into the dense forest surrounding the barracks in Blooming Grove around noon Sunday, though authorities suggested a day earlier that the suspect had already left the area. Dickson, a seven-year veteran, had transferred to the region from the Philadelphia barracks several months ago. Taken to a hospital, Douglass underwent surgery and was in critical but stable condition. Pennsylvania State Police Commissioner Frank Noonan said the "cowardly attack" was directed at state police and a "very dangerous, armed criminal" eluded quick capture. 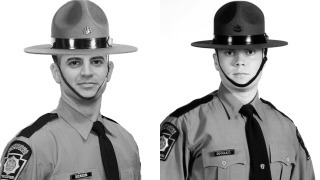 "Our troopers were ... shot without warning and really had no chance to defend themselves," Noonan told reporters Saturday afternoon. "It has touched us to the core that such a thing could happen." Pennsylvania Crime Stoppers, which posted the reward offer, asked anyone with information to call 800-4PA-TIPS or submit the tip online. Law enforcement officers from at least three states on Saturday searched state game lands surrounding the barracks in Pike County and beyond. "They were a committed couple," Melissa Contorno, a friend of Dickson's wife, told The Times-Tribune. "They were raising a beautiful young family. It's not fair." Blooming Grove is a township of about 4,000 people about 35 miles east of Scranton. State police spokesman Trooper Adam Reed said the barracks cover most of Pike County, a primarily rural area that runs along the Delaware River and borders New Jersey and New York.